Give any number of loose items a home behind your bathroom door. 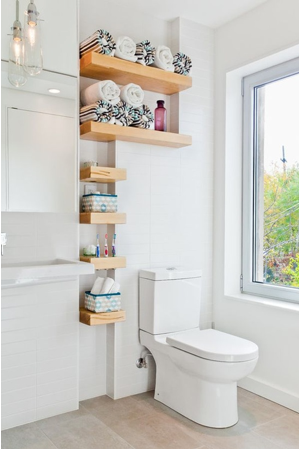 I love this idea because the bathroom won’t look cluttered from outside when the door is open and once you’re inside and the door is closed everything is in it’s place. 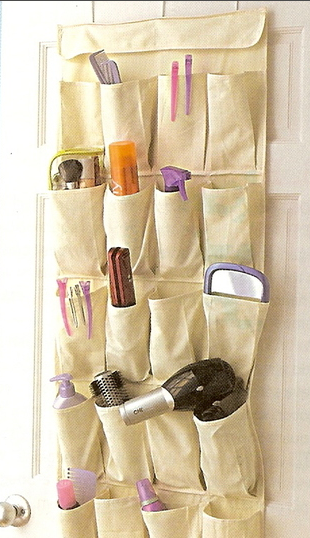 Another way to use this idea is to cut your shoe organiser to size and place it on the inside of your vanity cupboard door. Get creative with your placement and use of rails, hanging baskets and wall hooks and your clutter can be transformed into a visual feast. Attach lots of beautiful floating shelving to the wall space. You can go right from floor to ceiling and use the little nooks and crannies too. Store those small loose items like makeup by making removable plastic organisers which magnetically stick to the inside of the cabinet door. When you need them simply pull off the door, use the items and once your done pop it back on the magnetic strip. 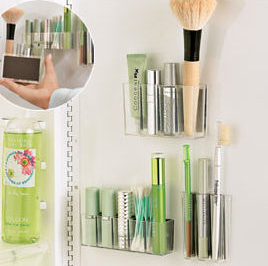 Extra tip: You can use small pots with lids to store things like hair ties and clips. 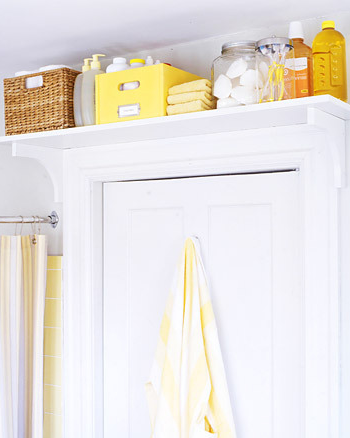 Add a shelf above the bathroom door for extra storage space. Arranging items in cute wooden and coloured boxes creates a design element to your bathroom which will make storing your items look slick. 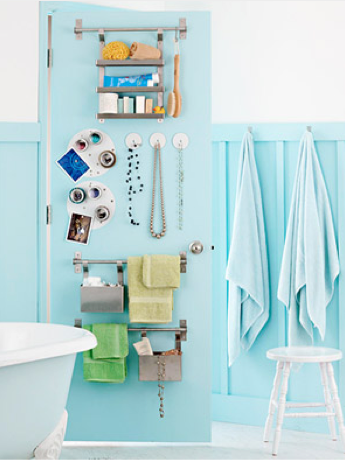 For more visual inspiration on great small bathroom storage ideas, check out this article on Shelterness. This entry was posted on April 11, 2013 by Paddocks in Bathroom and tagged apartment living, organise your bathroom, sectional title property, small bathroom storage ideas.